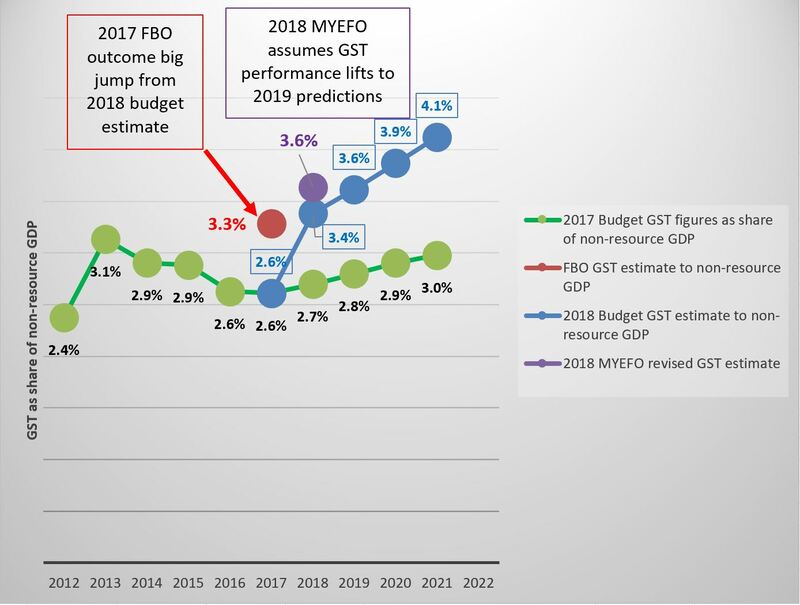 2018 MYEFO – Targets or Truth? PNG’s mid-year economic and budget update was released on 31 July. The summary snapshot presented by PNG Treasurer Charles Abel is “What this MYEFO is telling us is that the policies of the Government are working, the budget is back in control and the economy is improving.” (last line of Executive Summary p3). Unfortunately, the MYEFO reveals more a re-iteration of government targets rather than a true up-dated forecast of what is happening. 2018 inflation forecasts have been reduced from 6.9% to 5.9% in 2018.
overall GDP growth rates are expected to increase from an average of 1.4% from 2019-22 to 3.5% (based on a change in forecasting methodology rather than better prospects) and relevant graphs do not include updated National Statistics Office figures for much lower growth than previously predicted by Treasury. The good news from the MYEFO is that Treasurer Abel is clearly committed to the medium-term fiscal policies set out in 2018 – and on paper these look pretty good. The fact that the MYEFO is produced, and on time, is a positive indication of this element of economic governance structure remains in place. There is some acknowledgement that the PNG economy is performing poorly – there is more openness about this than revealed by Prime Minister O’Neill’s constantly up-beat comments. However, there are also serious problems with this document. Details are provided below. In summary, revenue figures appear to be overstated significantly in key areas such as the GST by at least K200m even before considering GST refund games. No information is provided about the K800m assumed to be received from the National Fisheries Agency for 2018. There are repeated examples of where it seems IRC and Customs have been instructed to simply state a revenue target will be achieved, even when the underlying economic fundamentals have changed. On the expenditure side, the spending controls have focused almost entirely in the areas of the capital budget and concessional loan financing. PNG appears to be aiming for an expenditure target even when this will hurt its longer-term growth rate best illustrated by the poor take up of concessional financing (only 27% by 30 June). There is no transparency on expenditure arrears. There is confusion on the level of interest payments, with indications this may total over K2 billion in 2018. Domestic borrowing in the first 6 months of 2018 totalled K6,367.1 million, well above expected levels (so 61.3% of the total 2018 appropriation). Reliance on a Sovereign Bond to fix rollover risk appears to be a high risk strategy in the light of recent credit downgrades. Indications are that PNG borrowed some K480m extra in 2018 to pay expenditure arrears from 2017, casting even more doubt about the reliability of the 2017 Final Budget Outcome figures released in March. There is no doubt that the new Treasurer is trying to improve PNG’s economic credibility. One way to do this is to continue claiming that the targets of the 100 Day Plan and the Alotau II accord are all on track. A better way is to be more transparent and truthful with what is going on and acknowledging that PNG needs some serious financial assistance to start turning around its poor economic performance. A deep hole has been dug by the O’Neill governments over the last six years and the path out is going to require more honesty and transparency than contained in this MYEFO. Despite recent assurances from the IRC that revenues are on track, throughout the document there are clear indications that the revenue generating agencies are simply being obliged to meet 2018 revenue targets despite the PNG economy doing worse than expected. For example, despite an acknowledgement that dividend payments from the LNG project and mines will be lower in 2018, the MYEFO states “the Government is still requiring the full payment of budget dividends to the State in 2018” (p17). So Kumul Petroleum may need to borrow or draw on other reserves to match the 2018 dividend forecast despite the inevitable consequences of the massive earthquake in February. Another example is that the lifting of tax rates on over 900 tariff items in the 2018 budget was built into increased import tax forecasts for 2018. However, the impact of increased prices has had a much more dramatic impact on reducing imports than expected – which must be a real delight to domestic producers although not domestic consumers. Specifically, there has been a fall in import volumes of tobacco products by 44%, alcohol by 47% and refined petroleum by 61% between the first six months of 2017 and 2018 (p38). However, despite these extraordinary falls which would usually affect revenue forecasts, the MYEFO simply states “collections are expected to meet the annual projections” (p37). The big revenue mover is claimed net GST collections. However, as argued in an earlier blog, it is a simple game available to IRC to delay valid GST refunds to PNG businesses to get a bigger number. 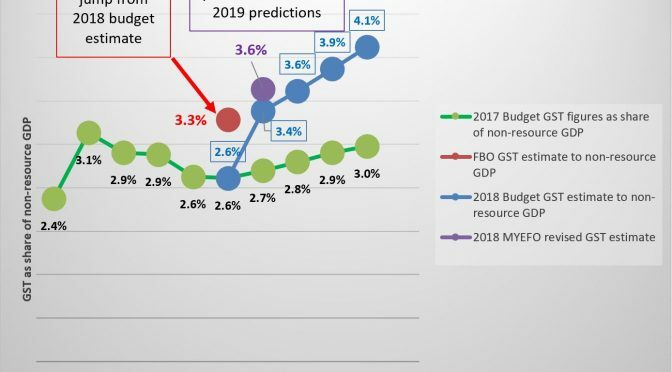 By lifting the expected net GST figure by another K112.5m, the following graph indicates that GST collections are now expected to be 3.6% of non-resource GDP in 2018, a remarkable increase relative to the 2017 Budget predictions of 2.7% and earlier performance. The government argues this is because of better resourcing etc to IRC. However, there is nothing that has changed that significantly in terms of IRC resourcing or commitment to compliance to justify such a large increase over the last 18 months. IRC has received better funding, a more flexible staffing structure and other support since 2012. It continues with its excellent leadership team that has always been committed to compliance and fairness and avoiding corruption – simply separating out the revenue components of the previous medium-term fiscal strategy does not make for such extraordinary turn-arounds. The figure on net GST collections would be much more credible if information was provided on levels of total GST collections as well as GST refunds – a very major item affecting budget bottom lines. Even then, for a flow tax such as GST (so its not lumpy like only a few payments a year such as company tax), it is reasonable to double the collections in the first six months to get a twelve month figure. Collections of net GST collections for the first six months of 2018 totalled K907.7m (Table 6 page 33). Total annual collections would reasonably be forecast to be double this or around K1,815.4m. This is some K160m below the budget forecast of K1,974.2m. However, this MYEFO, lifts this figure another K112.5m to K2,086.6m (all in Table 6). In addition to any GST refund games, based on collections by mid-year this estimate would seem to be high by around K270m. The really big unknown on the revenue side is the over K2 billion in “Other revenue”. The MYEFO gives very little information on the implications of “sweep” – the collection of funds in accounts from various state entities. The key component are an extraordinary K800m in funds expected to be collected from the National Fisheries Agency – K400m in 2018 dividends and K400m in “Transfers not elsewhere classified” (details are provided on p 45 of the 2018 Budget Volume 1 – there are not similar details in the MYEFO). The press indicates K60m was paid in August 2017 but this is a very long way short of the K800m still in the MYEFO budget document. There is just silence on this major revenue item – and this seriously damages the credibility of the revenue forecasts. The story about an increase in mining and petroleum taxes seems broadly plausible given lag effects (so much of the increase relates to high production in 2017). However, the increase of K142m is a long way below the absurd claims of a possible K1,500m windfall reportedly stated by Treasurer Abel in the press on July 19. The claimed increases in production levels following the earthquake are also considerably more optimistic than currently stated by private sector partners. Expenditure control is being imposed on the capital budget while wage spending continues at above expected levels. Overall expenditure levels are 41.4% of budget levels by 30 June. While this appears promising in keeping expenditure within the overall budget, the breakdown of where spending is being held back indicates PNG may be meeting a short-term target by cutting longer-term programs vital for lifting its growth rate and future revenues. Within this overall expenditure figure, the operational budget has spent 44.9% of appropriations, with Compensation of Employees (wages) running at 51.7%. In part this reflects a decision to make the 3% per annum wage increases for public servants and teachers in 2017 and 2018 which were not included in the 2018 budget. When the operational budget is out of control, it is questionable whether such payments should receive priority over other expenditure items. Capital investment programs are running at only 21.4% of the budget. When going through the one list of projects that have received little funding (Table 22), one can better understand PNG’s budget pain and the challenges of fiscal adjustment. However, the table reveals that almost all projects were to receive K20m, K15m or K10m. Such rounded figures suggest that project identification processes are still weak with little accurate project forecasting. At a high level, a similar disappointment is that concessional loan funding at 27.4% is at only about half the expected level. This is the cheap way to bring concessional loans into PNG. However, these require some counterpart funding, and the MYEFO acknowledges the “difficulties in providing project counterpart funding by Government that triggers loan disbursements”. This would seem a foolish way to cut expenditure. In the expenditure detail, there are some extraordinary stories. The MYEFO Overview indicates the largest item of the K78.6m transfer between the operational and capital budgets is “District Support Grant program to specific 22 Districts in the Country totalling K55.0 million” p6. However, there is no further information made about this transfer, or how 22 Districts were chosen out of the 89 Districts in the country. Payments from the Secretary’s Advance (Table 20 p60) once again makes for interesting reading. A major expenditure issue is that of expenditure arrears – also discussed in this blog. No information has been given on the level of expenditure arrears, and how they have changed during the first six months of 2018. This is once again an area where not paying bills can make the budget look much better than it is. More transparency is required to improve credibility. Interest costs have grown significantly in recent years. The 2018 budget started moving the overheads from loan borrowings (so fees for banks and agents) out of “interest” costs and into “goods and services”. This hides the full costs of PNG’s on-going annual loan borrowing. These additional costs appear to be very significant at over K200m – more than a full term of the tuition-fee free education policy. This is inferred from the difference between the interest expenses shown in some of the MYEFO tables of K1,864.7m and others indicating interest costs are now K2,092.1m (Table 19). The 2018 budget financing strategy is increasingly reliant on the Sovereign Bond. There is now an expectation that the bond will generate $US500 million as a once-off financing mechanism in 2018 (rather than only $US200m in 2018). Given the recent downgrading of PNG’s credit standing by Moody’s and S&P in March, this would appear a high risk strategy. The Sovereign Bond has been a key claim in budgets for over five years now – and it just keeps being put off. Serious financing from an IMF structural loan package is a better and cheaper path for PNG, and would help provide some political coverage for the economic policy adjustments required on areas such as the exchange rate. Domestic borrowing in the first 6 months of 2018 totalled 61.3% of the total 2018 appropriation of 10,388.5 million (so K6,367.1 million). This highlights the difficulties of getting non-domestic funding and the short-term nature of much of PNG’s debt. As Treasurer Abel has acknowledged, there is a serious issue is the structure of PNG’s debt portfolio. Indications are that PNG borrowed some K488m extra in 2018 to pay expenditure arrears from 2017, casting even more doubt about the reliability of the 2017 Final Budget Outcome figures released in March. Specifically, total net borrowing totalled K812.9 million, although the deficit to 30 June was K324.9 million. As stated by MYEFO, “the difference (K488.0 million) attributed to the repayment of outstanding arrears from 2017, changes in the float at end year, as well as changes in cash balances”. No information was provided on the last two items – an area which also would benefit from improved transparency.